F!g+ 2—The Crosby three-irîode "Product Detector" circuit, One triode can be eliminated by combining functions of V2 and V3* Eliminate plate circuit of V2r and grid and cathode circuit of V3. Connect plate circuit of V3 to V2 instead. The 1000-ohm pot în VI cathode is the IM adjustment» a rear-panel control. But in reception of SSB or CW signals, it's a necessity to produce results. That's rule one —the detector must be non-linear. So what's all this we read about 'linear SSB detectors" in advertising, product reports, and some theory articles? What the writers really mean is this: the detector isn't linear in its own operationj but it produces a signal which is related in a linear manner to the original modulation. The same confusion is present in AM detectors, They, too, must be non-linear to give results—but the most common type is called the "peak linear" detector. That's just the beginning of the confusion, though, The peak linear detector, which is inherently non-linear in itself, doesn't even give linear reproduction of SSB or \\ signals in most cases- W hile the input frequencies are mixed properly, the output is of almost constant amplitude. This destroys all naturalness in the received signal, and in fact makes it undecipherable. You might say its overmodu-lated—the sound is the same. Of course, distortion is still present with this arrangement — although some extremely pleasant-sounding SSB can be received in this manner. The major cause of the distortion is our ok I friend the square-law characteristic* If we could operate the detector in peak-linear fashion but escape the automatic amplitude limiting, we might do better, . . . The circuit of Fig. 1 is adapted from some of the oldest SSB circuitry in the books, but is still one of the least tricky arrangements around. The detector functions normally, and can be of any sort although a conventional diode is shown. The reason for this is that the detector thinks it s working with AM. . . .
Let's back off a couple of steps. Most receiver circuits combine the locally - inserted carrier with the incoming signal at the detector stage, to eliminate possible trouble with BFO harmonics which might get into the sets front end. Since the BFO is limited in output, you re usually lucky to find 10 volts of local carrier at the second detector. In contrast, incoming signal may range as high as 20 to 25 volts. However, for true "mixing" action as opposed to simple beat-note production, the carrier must be at least four times the amplitude ol the incoming signal. Distortion will decrease as carrier increases, so the more, the merrier. When you cut back the rf gain, you not only forced the detector into the square-law region but you also cut the level of the incoming signal down to less than a fourth that of the local carrier. But to keep the detector operating in the 'linear" region, it s far better to boost the level of the local carrier. If the local carrier is at proper frequency, the detector stage then cannot tell the difference between SSB and AM— and your ears won't notice the difference either. By using a low - impedance potentiometer and shielded interconnecting leads, you can control the BFO voltage injected into the last if stage. The less voltage injected, the lower the carrier level at the detector will be. If the BFO is tightly enough shielded, it can be left in operation at all times for better frequency stability. With INJECTION controls set to zero, AM reception will be possible. Injection can then be increased as necessary for SSB and CW. To use tins trick, first tune to the SSB or CW signal with INJECTION set to zero. Tune for maximum wiggle of the S-meter needle, rhen slowly increase the injection until the 5-meter just stops wiggling. Adjust frequency of the BFO as necessary for a natural sound. If distortion is noticed, increase injection slowdy until it disappears. You can now give an honest S-meter reading, because when the meter steadied you had injected just enough carrier to produce equivalent 100 percent modulation at the detector of vour receiver. AVC will not be active, but you 11 hardly notice its loss. The ordy two disadvantages of this circuit, aside from the added front-panel control, are its susceptibility to BFO leakage and the nuisance of having to adjust another knob. detector circuits as well), requires only a small amount of BFO injection voltage and features especially-low inlermodulation distortion, due to the adjustment provided. Its operation can be explained only by resorting to columns of algebraic equations. Approximately, though, the first two triodes act as cathode followers, one driven by the if strip and the other by the BFO. Since they share a common load resistor, the two incoming signals are mixed in the load. 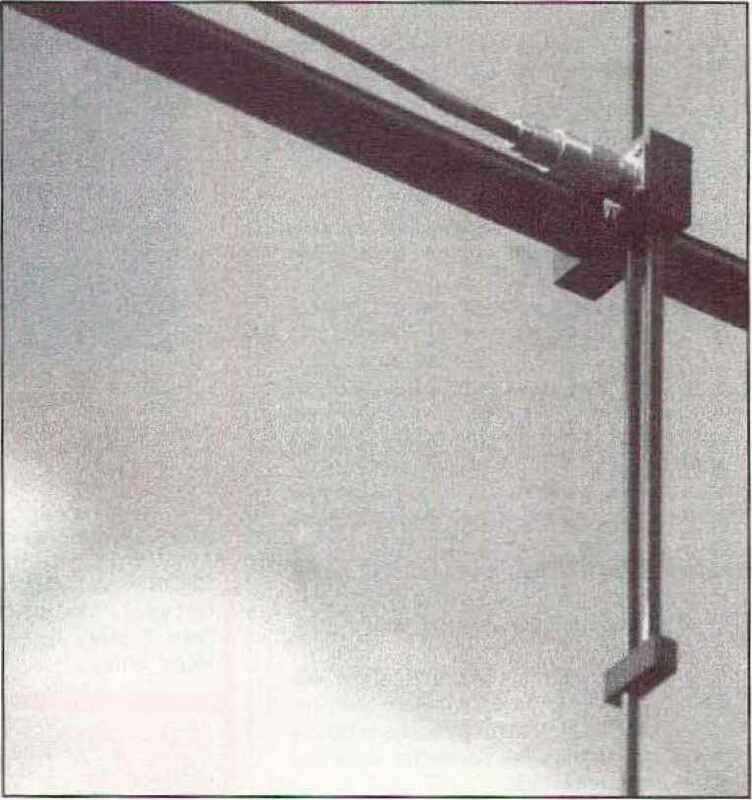 This common load resistor is also the source for the third triode, a grounded-grid amplifier. 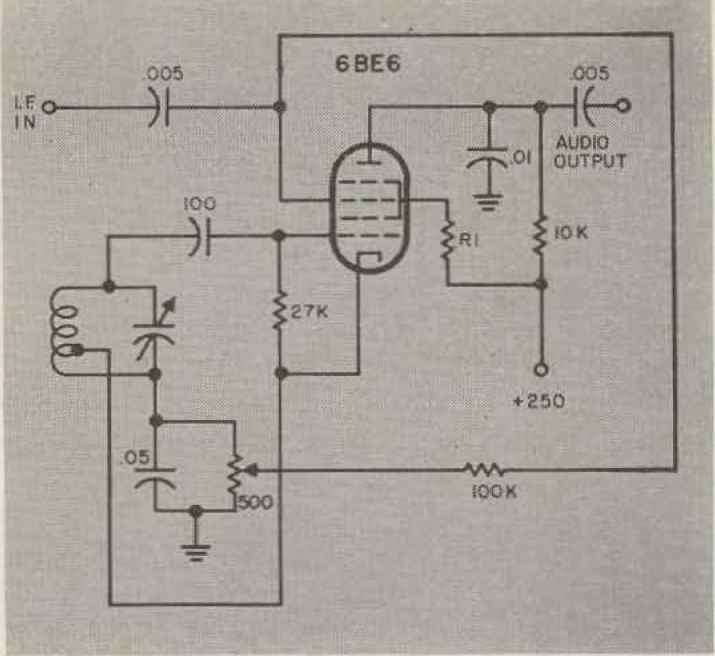 It isolates the mixing portion of the circuit from the audio output elements (and in one variation popularized by one W2NSD, was combined with the BFO cathode follower with no loss in performance). The potentiometer adjusts operating bias of the tubes, and is set for minimum distortion. Advantages of the Crosby circuit and modifications of it have aheady been listed. Its disadvantages are these: IT Audio output is much lower than from other detectors, usually requiring an extra stage of audio. 2, The detector is easily overloaded* 3. Adjustment of the IM pot is critical. 4. The circuit is com-lex, requiring at least two tubes and a number of extra components, not to mention a separate BFO* When used, it is best built as an outboard unit for this reason alone. One of the next circuits announced after the Crosby detector gained popularity was the pentagi id-mixer detector. Its almost impossible to give proper credit for this one, since a number of amateurs published circuits of similar nature at almost the same time. At any rate, it was a logical development, once the point was firmly made that detection is mainly a mixing process. Fig. 3—This pentagrid mixer circuit gives approximately the same results as the Crosby detector, with a slight increase in audio output. IM distortion Is reduced by adjustment of the 500-ohm potentiometer. Value of Rl must be determined by experiment. Start with 33,000 ohms: reduce as necessary (in 5 percent steps] until no trace of distortion is heard on strong signals. The pentagrid detector, shown in Figure 3, is almost identical to a standard mixer circuit as used in the receiver front end. The major difference is that output is taken through an audio network instead of through an if transformer. Another difference is the IM adjustment pot, which allows this much-simpler circuit to compete with the Crosby array on equal terms so far as distortion is concerned. Advantages of the pentagrid detector include simplicity, low distortion, ample audio output, and the ability to substitute on a tube-for-tube basis for an existing BFO since the pentagrid detector requires only a single tube for all functions. Several detector circuits can be built around the sheet-beam tube. One of the simplest is shown in Fig. 4. It was apparently originated by ZL1AAX and later developed by RCA engineers. he secret of this circuit lies in the tube itself, t s a cross between an rf pentode and a cathode-ray tube, having deflection electrodes where most pentodes have suppressors. With one cathode, one control grid, one screen, two deflectors, and two plates, the tube's output can be switched from one plate to the other by signals impressed on the deflectors, At the same time, the output can be modulated by a signal on the control grid. 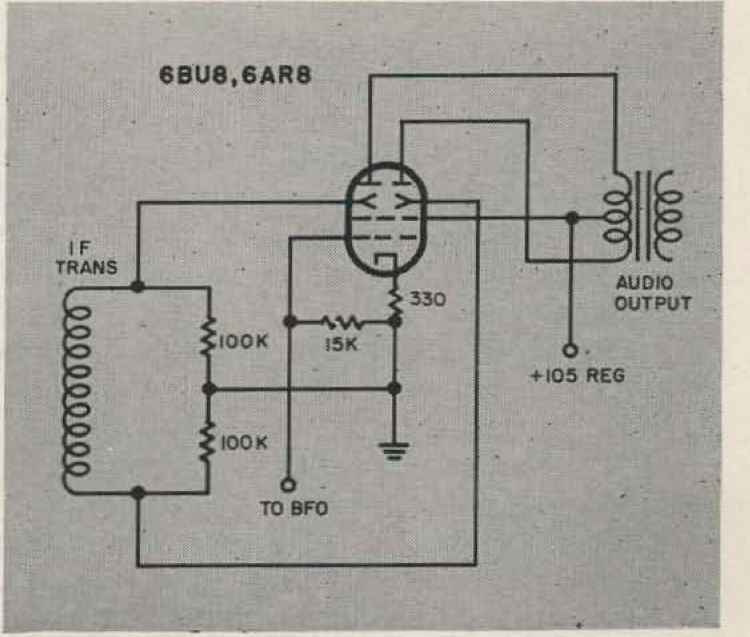 When the if strip output is fed to the control grid and the BFO signal is fed to the deflectors» the average current to one plate (either can be used) will be a replica of the original audio, This means that output can be taken from the plate circuit. If the if output is fed to the reflectors, however, and the BFO signal goes to the control grid, the audio will appear (in push-pull fashion) at both plates. Using a push-pull transformer will allow the B rO signal to be cancelled out, eliminating possible overload of later stages. Fig, 4—The sheet-beam detector originated by ZLIAAX features minimum distortion and maximum audio output; Although a separate BFO is shown, it sh ould be possible to use the control and screen grids as BFO elements in an electron-coupled circuit. Major disadvantage is the specia Itube required.